Packed with iconography, Madonna and Chancellor Rolin combines the earthly world with God's. In much of the theme of a 'Heavenly Jerusalem van Eyck uses symbols to represent the Old Testament, the New testament and the transition through Christ between the two. The exact location of this scene is unknown but it could be at an aristocratic residence, religious building, the Chancellor's palace, or a fortress. 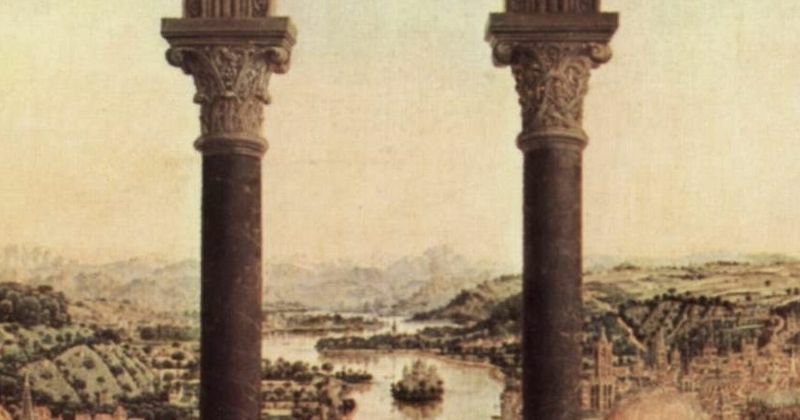 Using Roman columns and classical architecture was common in Flemish paintings to connect with the Old Testament. Reliefs depicting the Seven Deadly Sins: Illustrations of the seven deadly sins can be found in the reliefs over Rolin's head. All of these images are on Rolin's side of the painting and possibly constitute a crown for him. Globe: Jesus holding a globe with a gold cross symbolizes Christ's earthly power and his spiritual force, while the crystal symbolizes Mary's virginity. Wine: Wine is represented by the sacrifice of Christ, his blood being the wine. Above the chancellor man is debased by wine, seen in Noah, and above Mary, wine is man's salvation. Rolin owned much of the vineyards in Autun. Chancellor Rolin: Rolin is wearing a gold brocade jacket trimmed with mink. He kneels in prayer on the left of the image. His gaze is pensive, looking as though he has just raised his eyes from his Book of Hours. The Book of Hours was intended for the lay population but served as a public display of material wealth, family heritage and piety. Virgin: Sitting on a decorated cushion placed on a marble seat with geometric designs, her red cloak is trimmed with braids, pearls and jewels, heightening the solemnity of the scene. The cloak has an inscription in gold from the liturgy of Matins which focuses on Creation. 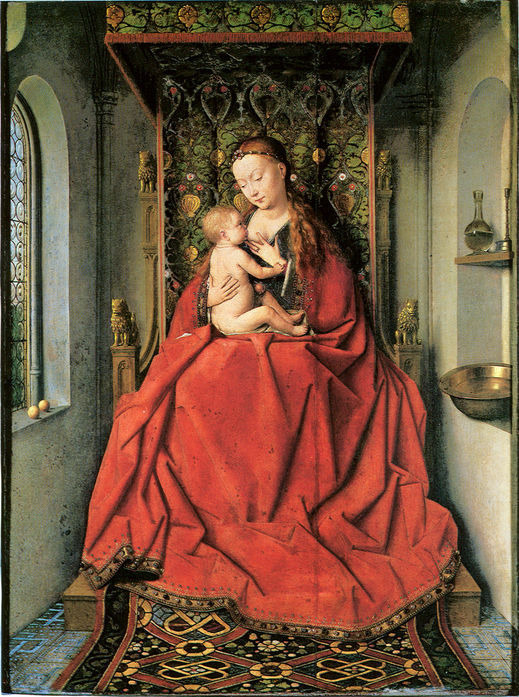 The way the Virgin is seated and presents Jesus, depicts the traditional pose of the Virgin of Wisdom. This motif is known as the Throne of Wisdom. The Virgin's body is often compared or seen as an altar. The words "elevate exaltata" written on her dress refer to the mass of Matins and highlight the story of Creation. 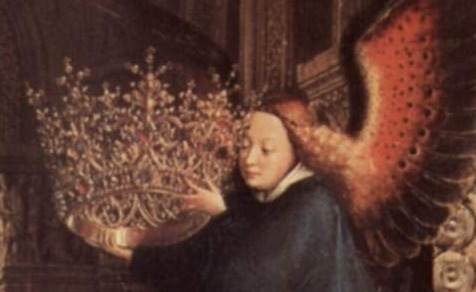 Crown: This refers to Mary's coronation in the heavenly city of Jerusalem. Manuscript: The illuminated manuscript is open to a page with the letter "D" on it, probably indicating "Domine, labia mea aperies. " (Lord, open my lips. ) This is a Book of Hours. Flowers: The flowers painted symbolize Mary's virtues. The white lilies symbolizing purity; the peony, a flower from the East, representing Paradise; a wild rose, symbolizing suffering; Irises, with their sharp, blade-like leaves, symbolize Mary's pain; Daisies symbolize innocence. Magpies - The two birds, probably magpies, may symbolize death. Two Peacocks - Symbols of immortality and pride. Peacocks were associated with the legend of Juno whose flesh did not decay. Two Men - One man is leaning on the parapet probably emphasizing the castle's position. 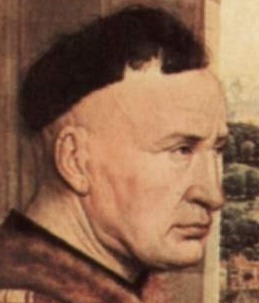 The other man could be Eyck. He is wearing something similar to "Man in a Red Turban" which is thought to be a self portrait. Two Cities: Probably based on the philosophy of Saint Augustine and Saint Thomas Aquinas, the presentation of the two cities offers a tangible expression of spiritual values and concepts and were probably apparent to the viewers of the time. River: Echoing the foreground, the river divides the holy and the mortal while Christ points to the bridge to demonstrate his role and bring together the real and the unreal, the holy and the actual. Cross: The cross on the bridge represents Christ's sacrifice in order for the two worlds to be connected. Commissioned by Nicolas Rolin, who also worked under the Duke of Burgundy for his church Notre du Chastel in Auntun, the painting probably shows not only the dual worlds but the chancellor's role as a man with business. 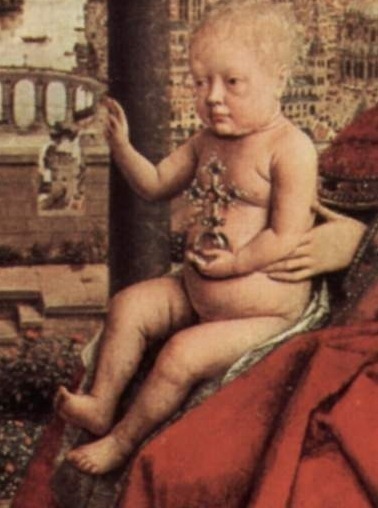 The painting could also be connected to his son's then newly-acquired position as Bishop of Autun. From infra-red treatment of the painting we can see that Rolin probably had a hand in the painting. Jesus was originally drawn to point downward toward the floor but this was changed and he is seen pointing right at the chancellor. This painting, like most of Jan's paintings, comprises itself in detail. 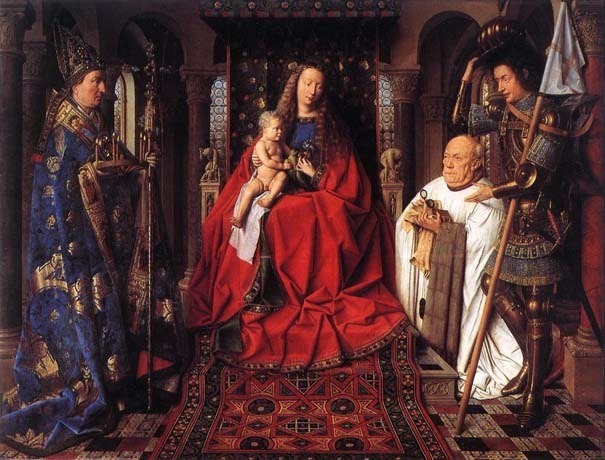 The amount of light and indirect light allowed Jan van Eyck to further delve into shading and the richness of a color. This painting is layered not just in paint but in meaning and dimensions. In the foreground, middle ground and landscape we get a sense of story or an inter-working between all the levels, each with an infinite amount of detail. The painting is arranged in a symmetrical composition that separates the divine world of Jesus and Mary from the physical world of Rolin. Mary's dress heightens the solemnity of the scene with a deep red color and brocaded with jewels. Also the use of color in the angel's wings, rainbow colored, symbolizes a link between earth and heaven. The uses of light add depth to the painting and define space. The light falls over the characters from the right-hand side which cleverly corresponds to how the picture was hung in the church and the natural light from a church window hitting the painting. With the use of a bright horizon along the top of the mountains, the painting achieves another layer of depth. 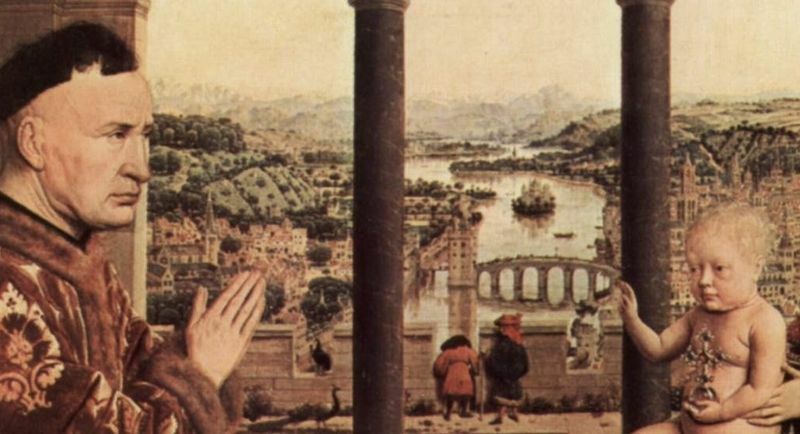 This technique called "atmospheric perspective" was common in Flemish painting. Oil paints allow van Eyck to slowly give detail, layering the paint on top of each layer until the desired tone was achieved. This process is called wet-in-wet and can only be achieved with oil. 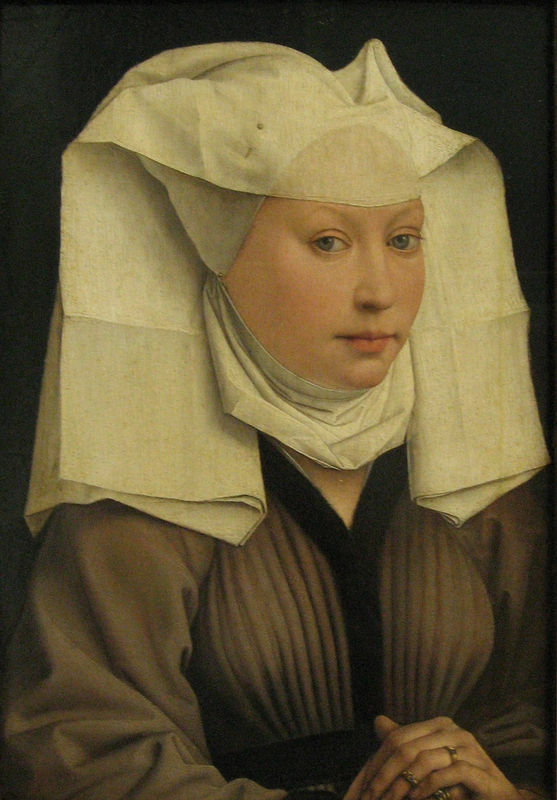 This style of painting was increasing helpful to van Eyck in exploiting the use of light. The subtle shading and reflections were slowly created and finished with precision. Across the tiles floor we have designs of eight-pointed stars which correspond with the colonnades to produce a retreating lines of perspective. 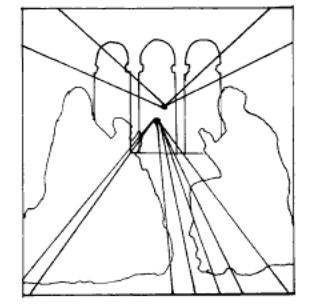 The lines however do not connect and the viewer is left without an exact vanishing point but a general vanishing area. The garden behind the arches creates a middle ground to add a higher sense of distance and perspective. The garden also serves as a reference to Mary. Like other Flemish painters, van Eyck painted the background in a painting-in-painting style that makes the viewer look closer and closer to one section of the painting. It creates a soft interior light with a stronger light outside. That, highlighted with the bright blue lines on the horizon, gives the landscape a strong sense of depth. 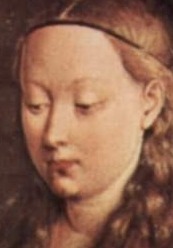 Mary is shown in a 3/4 portrait allowing the viewer to see more of Mary's face and her expression. This is characteristic of Jan's work and Flemish painting. With the painting-in-painting style, the viewer is often drawn into one area of the painting and must go closer to see it. Each section or plane of the painting is rich with detail and lighting techniques to enhance it individually. This painting is characteristic of van Eyck's work in that it conveys a sense of realism through detail and especially the use of light. In one of his works there can be four vanishing points at one time, allowing him to use indirect light to draw the viewer into the painting. 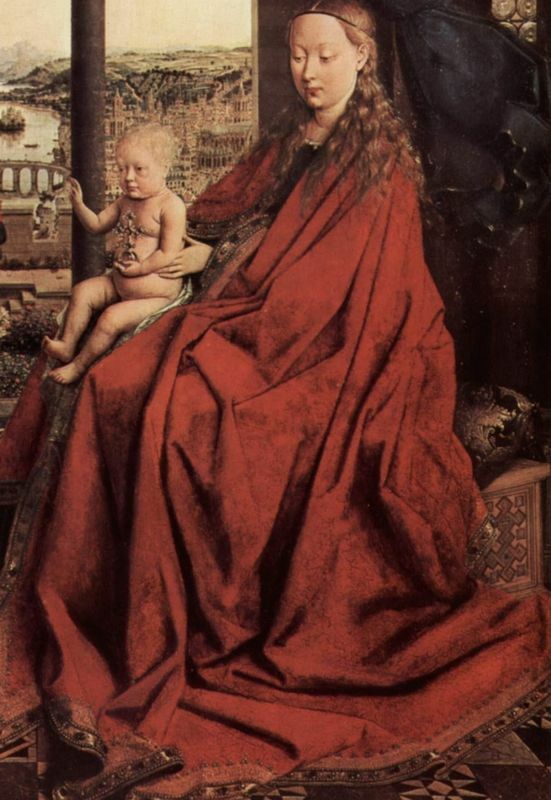 Different from his Italian contemporaries, the characters in van Eyck's Madonna and Chancellor Rolin lack a spatial correctness which, in turn, produces a contrast against the detail. In this painting Chancellor Rolin and Mary are painted the same size which would probably not have happened in either the Dark Ages or the Florentine Renaissance. Furthermore, in contrast to the slightly mis-shapen room, the 3/4 profile of Mary and the Chancellor's expression are realistic while the room warps around them creating an interesting mix, intended or not, between the world of God and that of man. Sometimes overshadowed by the Ghent Alatrpiece and the Arnolfini Portrait, Virgin with Chancellor Rolin nevertheless continues to intrigue scholars. 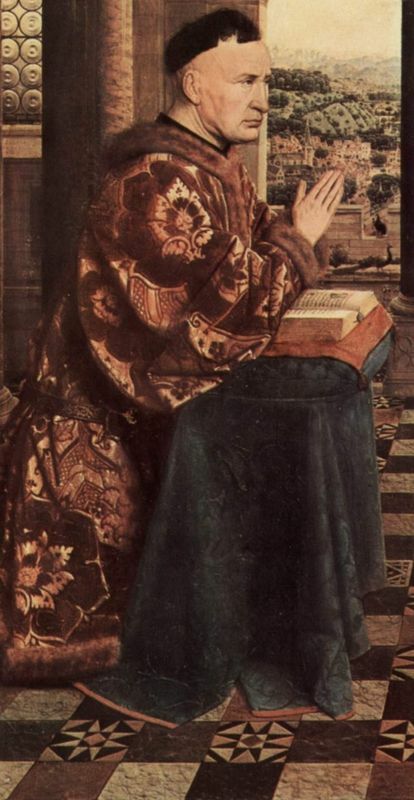 Much of Jan van Eyck's style and technique have been copied throughout centuries and his achievements with oil painting and perspective based in detail highly celebrated. 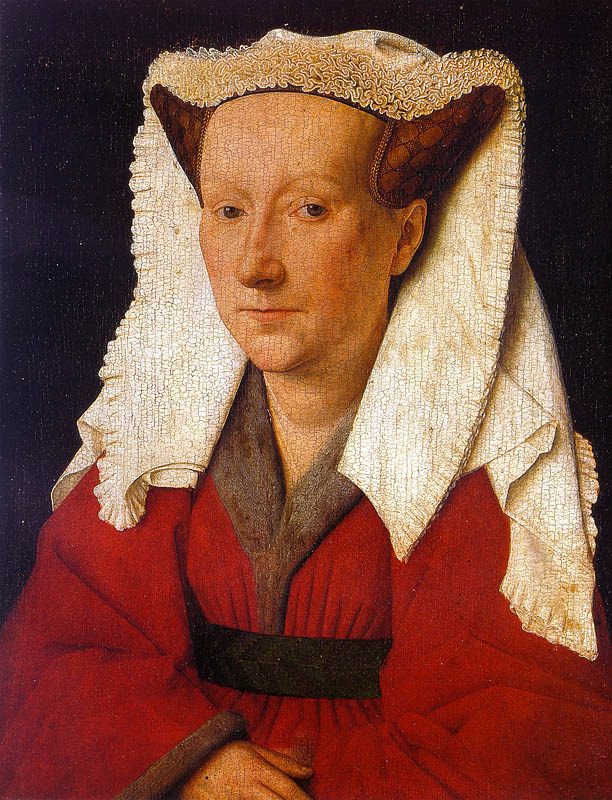 Van Eyck's employment under Philip the Good, Duke of Burgundy, was rare and shows that he was a highly regarded painter of his time. Today his painting style is not under discussion but his iconography, such as Mary's crown in Virgin with Chancellor Rolin, is still debated. Madonna and Chancellor Rolin was in the Notre Dame du Chastel church in Autun until 1793 when it burned down. 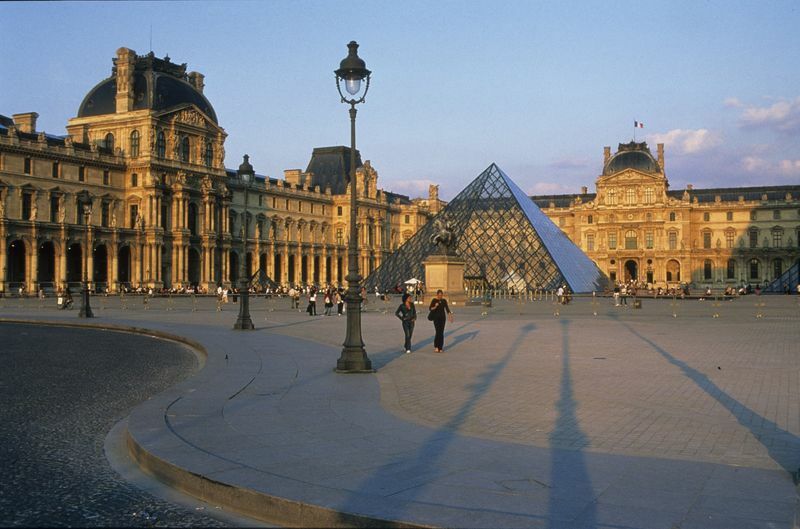 It was then moved to Autun Cathedral for a short period of time before moving permanently to the Louvre in 1805. Through his use of oils Jan van Eyck managed to achieve innovations in perspective which would later come to define the Northern Renaissance. 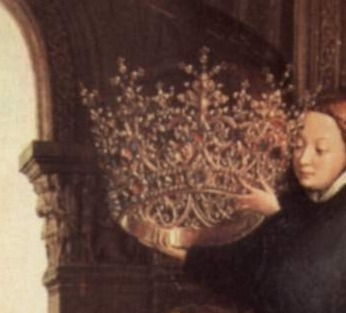 Working as an illuminist, van Eyck had an acute attention to detail. His use of light and especially indirect light enabled him to present textures, emotions and personality in his images. His developments in oil painting and the use of the 3/4 profile view has not been overshadowed by today's standards. Jan van Eyck worked most of his life under Philip the Good, Duke of Burgundy, and traveled to Portugal, Italy and probably the holy lands to investigate, make business and marriage deals and gain inspiration. It has been noted that van Eyck could have seen some of the early Florentine Renaissance paintings from Masaccio but van Eyck's innovations are predominately his own. The word 'Renaissance' comes from the Latin word "rinascitá" which means rebirth. While Italy and the southern Renaissance reworked older ideas of mathematics, art and philosophy, the northern Renaissance shed its skin of the Gothic or International style and was home to the Reformation. Around the 14th Century Europe saw former serfs traveling from town to town and commerce soon led the way for trade and an exchange of ideas. With the advent of the printing press and other inventions, human thought began to achieve new landmarks in the Renaissance. Formally all books, mainly bibles, were copied out by hand and were only available to the rich. The Renaissance was an effort to understand the nature of man and depict him in a realistic light. It furthered mankind's understanding of himself and the world around him. To learn more about the life and works of Jan van Eyck please refer to the following recommended sources.